Coveo provides highly advanced search and relevance for personalised online experiences within Sitecore websites. Out of the box, Coveo makes Sitecore websites more relevant to visitors through a deep and highly productized integration that provides broad connectivity, an advanced Relevance Engine and Java Script Interface editor. Coveo for Sitecore transforms website experiences by unleashing the power of the entire content ecosystem and ensuring that only relevant content – highly valued by visitors – is dynamically searched, filtered, presented and recommended based on each visitor’s unique context.Coveo provides highly advanced search and relevance for personalised online experiences within Sitecore websites. Out of the box, Coveo makes Sitecore websites more relevant to visitors through a deep and highly productized integration that provides broad connectivity, an advanced Relevance Engine and Java Script Interface editor. 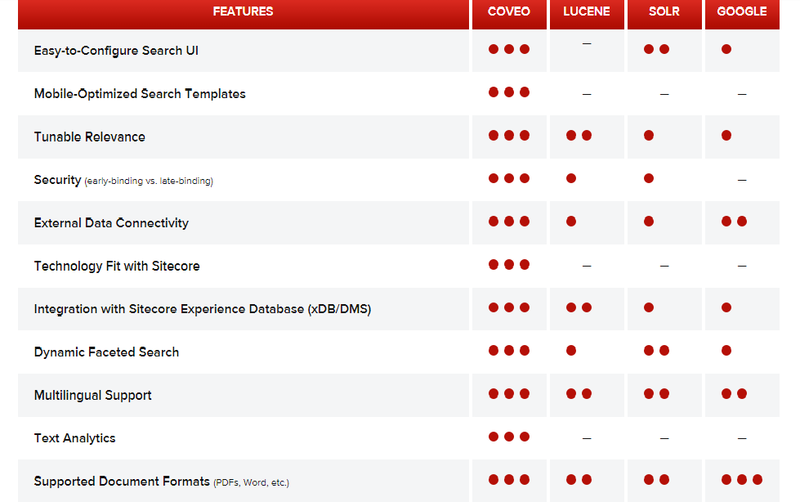 Coveo for Sitecore transforms website experiences by unleashing the power of the entire content ecosystem and ensuring that only relevant content – highly valued by visitors – is dynamically searched, filtered, presented and recommended based on each visitor’s unique context. Below are the comparision with lucence,slor and google.